Our European Online Shop only offers shipping within Europe. So, if you’re located in Europe, please order there. 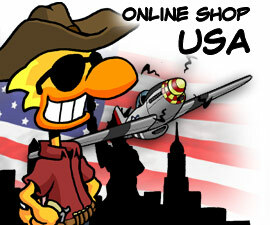 For orders from the USA and all other parts of the world, please go to your US Online Shop. You can also go to our Chicken Wings Custom Shop, powered by cafepress, where you can choose from a wide variety of products and have our comic strips printed on them! The easiest way to navigate and choose a strip is by finding them on our website and then follow the “Buy this strip” link underneath. You can also get Chicken Wings apps for your iPhone!